The value of older reference books is determined by a number of factors. The profusion of encyclopedias and the lack of the currency of their information often render them very low in value. This is a guide about finding the value of the Encyclopedia Americana. How much (in 1965 dollars) did a new (1965) edition of the Encyclopedia Americana cost? It was a thousand dollars for a set.You could make payments. How do I find the value of my 1959 Americana encyclopedias collection? I have a set of Encyclopedia Americana, the 1948 edition. What is it worth? Many people try to sell their old Encyclopedias on eBay. Some sit on eBay for months on end. There really isn't a high demand for old encyclopedia. You might be able to asked $50 for the set. However, the cost of boxing these up and sending them in the mail will cost a fortune. Therefore, it is better to find a person in your area that is willing to buy them. You can also donate these to a school. Libraries have so many I don't they they accept anymore. I have a set of 1955 Encyclopedia Americana books. All 30 books are in excellent condition. I believe that I have the whole set of Americana encyclopedias, they are in great condition and the year they were made in, is 1829. Are they worth anything? Encyclopedia sets that date before 1923 may have some value if they are complete and in good condition. You can check on online and on EBay, antique book collectors in your area or online etc. Anything over 100 years old is an antique, and may be valuable. Take these to several dealers, and see what they say. If your set is truly a set from 1829 in great condition then you may have a fairly valuable set. Many people ask questions here and later find out they did not read the correct publishing date (that would be the last/latest date listed) but you may be lucky and have a nice set. If it is an 1829 set then you probably will not find a set for sale on auction sites. There are some book sites that will give you an estimated value but they usually charge a fee and you would need good photos. Here is a link you might find interesting. I have a complete set of The Encyclopedia Americana purchased in 1962 and also "Lands and People" Volume 1 - Volume 7, annuals from 1963-1979, Science Annual 1979, Bicentennial Almanac 1776-1976, and the Americana Dictionary. They are all in excellent condition; some have never been opened. We also have Grolier Encyclopedia year books from 1977-1983. You can check online for old book collectors, on EBay, Craigs List and other retail sites for possibilities. Everything is now online and updated constantly so old books are just that-old. Your encyclopedias may sell if you list them on Craigslist but probably for a low payment. These do occasionally sell on eBay but may take a very long time to do so. They are also very difficult to ship. I think you would be better off financially donating them and taking the tax deduction. The information is outdated, and people use the internet now, not encyclopedias. I have a set of 10 old books titled "The Americana" - A Universal Reference Library. Copyright is 1904-1906. They are not in perfect condition. How much are they worth? These are over 100 years old, and considered antiques. Condition and a complete set will command a higher price. Take them to several book dealers to get appraisals. Although old these sets are not very sought after. You will find some similar (year, condition, material) but there have been no sales of a set on eBay or Amazon in the past 6 months (maybe even years). Many sellers list books like this and just keep relisting over and over (weeks, months, years - really!) in hopes someone will decide to buy. Some ask outrageous prices hoping someone will pay the price (a little deceiving as the asking price sometimes will make a person think they are more valuable than they may be) but then, once in a great while, someone will buy a set. Be sure you are looking at the printing date and not just the copyright date as that is how books are listed. Also, something like this is costly to ship (usually adds to the price the buyer pays) and definitely not easy to pack and ship. I have a set of Encyclopedia Americana plus the year books from 1975 to 1984. I am wanting to know if they are worth anything. All are in excellent condition. Some of these sets can still sell but they are very slow movers and sellers usually have to relist these for months/years. These sets are also very difficult to ship so you may want to start with a listing on Craigslist and maybe you will be lucky and find a buyer. Have a 30 volume set of this encyclopedia, 1943 edition. Is it worth anything to collectors? Or is it only of sentimental value? Copyright. 1943, Encyclopedia Americana, 30 book set. What are they worth? I have a complete set of the Encyclopedia Americana; published in 1914. Is it worth anything? Value is based on how many complete sets are still around and condition. Probably little to no value. I used to work for an historical library and we got calls about these and old bibles all the time. How can I find the value of a set of the Encyclopedia Americana in 32 volumes, copyright 1957? 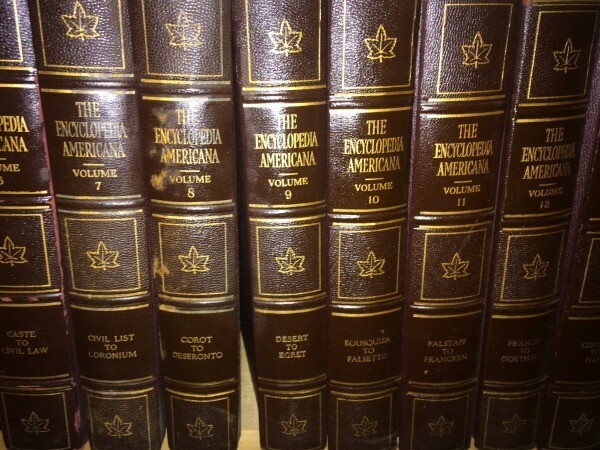 What is the value of a set of Encyclopedia Americana along with the several annuals from the 1980s? They are in excellent used condition. Seems almost everyone has old books they think are important and want to sell. Most old dictionaries, encyclopedias, etc., have very little value-a few dollars at most. You can check online for old book collectors, on Craigslist and other retail sites for possibilities. Everything is now online and updated constantly so old books are just that-old. I have a complete 30 volume set of the Encyclopedia Americana, 1954 copyright. It is in very good condition. Are they worth any money? Probably not. No one wants them. You can't give them to charities. You may find someone who wants them for some sort of craft project, that you can give them to. They are not worth anything. Someone that is interested in that year for personal reasons, ie.....born that year....might be interested put on Craigslist for 50.00 or BO see what happens. I have the complete set in very nice condition. I cannot find any information as to their value. I have a set of 1986 Encyclopedia Americana, published by Grolier Incorporated and would like to know if they're worth selling. If so, where can I sell them? 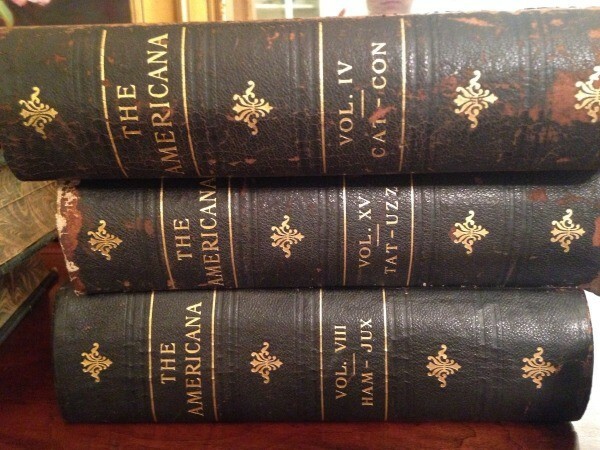 I have a set of the Encyclopedia Americana, volumes 1 - 30. I don't want these books and am wondering where to sell them. My husband is an auctioneer, and sadly, these books usually bring only a couple dollars. You can access many encyclopedias online, that are updated daily, so the older ones don't carry much value. Perhaps in another 100 years they may. 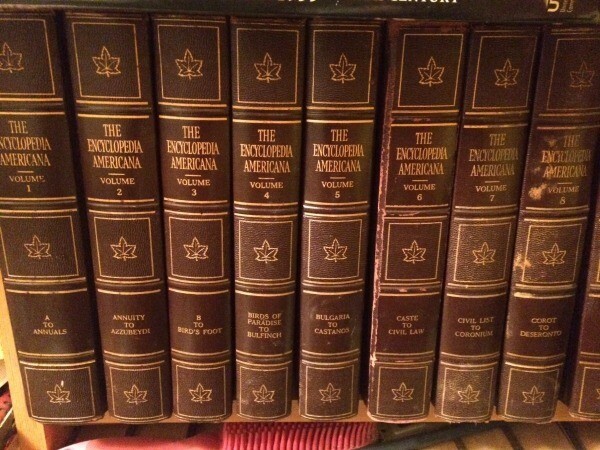 What is the value on encyclopedia Americana 1984 -1986 editions? I have a set of old encyclopedia Americana volumes 1 to 30. The first issue was published in 1964 by Americana Corporation. I have a complete set of 1905 Encyclopedia Americana. What would their value be? 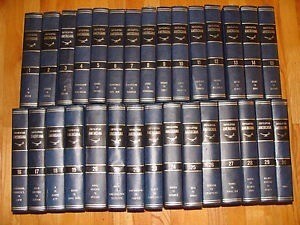 I have a set of Encyclopedia Americana, International Edition, 30 volumes, 1st published 1829, copyright 1965. They are in mint condition. Can you tell me an approximate worth? I have a complete collection of 1936 Americana, volumes 1-30. I want to know if they are worth anything. I own the 1973 - 30 volume set of Encyclopedia Americana and annual year books 1973-1993. How much are these worth? Where could I sell them? 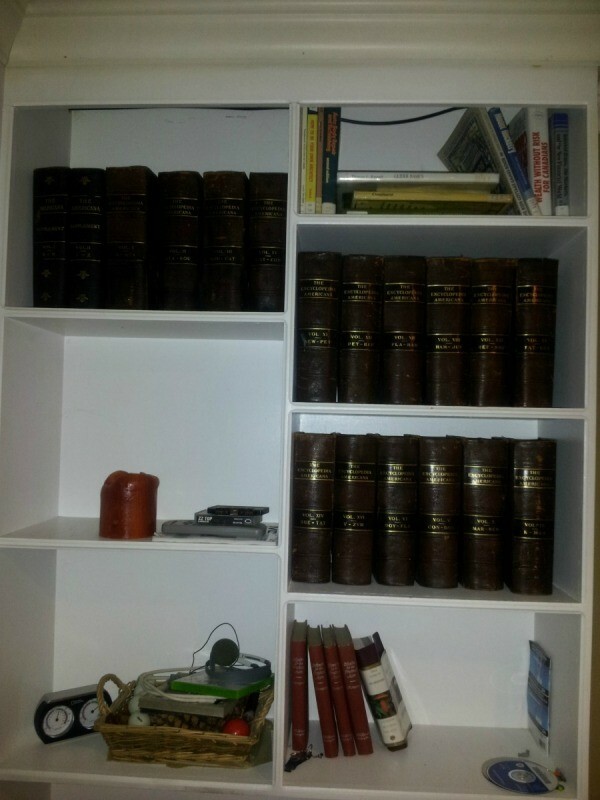 I have a complete set, 30 volumes, of the Encyclopedia Americana, from 1937, Universal Knowledge. By Americana Corporation 1937, W.B. McConkey Company, printed in U.S.A.